Officials in North Andover, Massachusetts, are processing dozens of claims at a time after the gas explosions that rocked Merrimack Valley. The town manager of North Andover, Massachusetts, is asking for volunteers to help at a new Columbia Gas Claims Center. The center opened Wednesday and is located at 115 Main St. It will be open 12 p.m. to 8 p.m. Tuesday through Friday and 9 a.m. to 5 p.m. on Saturday. 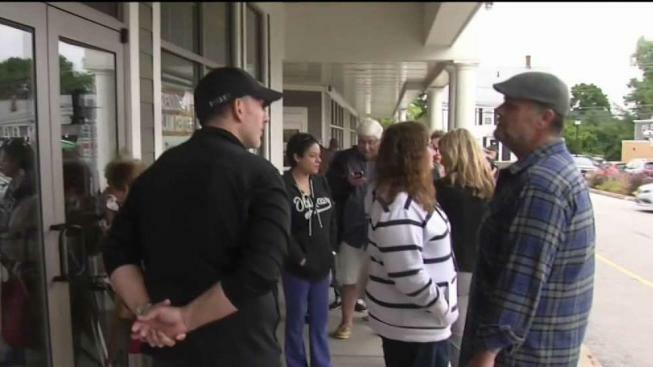 Those in line who were affected by the Merrimack Valley gas explosions said they were waiting not just for vouchers, but also for answers. "I have no hot water, I have no gas to cook and I don't even know if my street is safe for my family to be on," Joseph Fillipon of North Andover said. "Instead, they just gave me two $100 gift cards and told me they will be in contact." Workers at the center could not give a timeline, but were able to give out gift cards to help replace items such as spoiled food. At peak, the town manager said they were processing 40 customers at a time. "We have people who have been dramatically impacted by this event and will continue to be impacted for months," North Andover Town Manager Andrew Mayor said. He posted on social media asking volunteers to donate their time at the center if they can. Ingrid Rosales is one of many who saw the post and came in to help translate after waiting in line for assistance herself. "Everyone that has the time, please come down and help," Rosales said. "We are all in the same boat and we should all help each other." Anyone interested in donating time at the center should contact the town manager's office first at 978-688-9510.